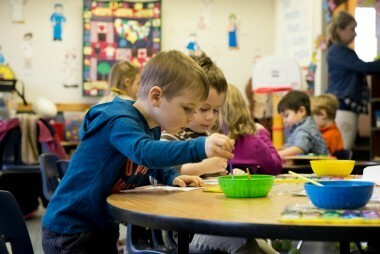 Li’l Lions Preschool is Greater Portland Christian School’s state-licensed program for children ages three (nursery school) and four (preschool). It is designed to start children on a lifelong journey of age-appropriate, joyful learning based on the biblical perspective, as well as to prepare them for our kindergarten program. Children are taught by trained, caring teachers in a nurturing, Christian environment. Our program is based on the same basic Christian values as Greater Portland Christian School. Weekly chapel time includes a Bible lesson and singing. Our children enjoy daily Bible lessons and prayer. We want them to understand that God loves and cares for them. Our program follows the GPCS school calendar, beginning in late August and ending in mid-June. Full Day (8:00AM – 2:30PM) and Half Day (8:00AM – 11:30AM) options are available for both nursery school (3 year-olds) and preschool (4 year-olds.). Rates are for the current 2015-16 school year. Rates for 2016-17 will be posted by April 1. There also is an after-school care option available for those who need care from 2:45 – 5:30PM.